Country Lakes – NEW PHASE! A Place to Live with Space to Play! 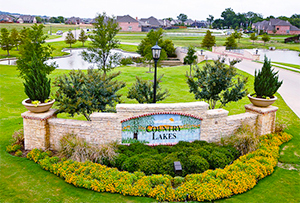 Come relax and enjoy life at Country Lakes! This classic master-planned new home community is situated on over 640 acres in the wide open countryside that surrounds Argyle, Texas. This community is brimming with opportunities for an active lifestyle along with amenities that are sure to foster new friendships. Just outside the door of your affordably priced Innovation Builders home, your family can enjoy a vibrant array of inviting amenities such as beautifully landscaped greenbelt areas, quiet parks, serene hike and bike trails, and future school sites. Known for its family-friendly outdoor lifestyle and sense of community, at Country Lakes you’ll feel right at home the moment you arrive. At the heart of the community is a beautiful club house and aquatics center with an incredible pool, playground and kiddie pool. True to the Country Lakes name, an elaborate system of landscaped lakes and waterways flow throughout the community. Discover how Country Lakes can make every weekend a vacation, and every day a new adventure!